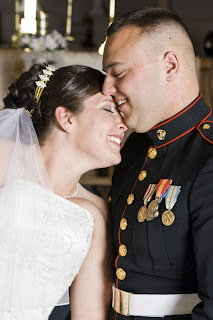 Tiffanie and Kevin were married in Ponca City. There was a beautiful, blue sky for the wedding day. The ladies were gorgeous and the men in uniform were quite handsome. Ponca City is the home of the Pioneer Woman Statue. She’s a twelve-thousand pound, seventeen foot tall woman. That’s a rather large lady. But, you have to take into account her little boy and the bag and Bible she’s carrying, they’re also cast bronze, so that’s part of her weight. Forty thousand people came to hear Will Rogers speak at her unveiling in 1930.